Where you aware Chutney doesn’t just describe a recipe of mixing tomatoes with spices? There are other references to Chutney, such as Chutney music that was established in the 1940’s within the temples, wedding houses, and sugar cane fields of the Indo-Caribbean. The first recorded music did appear until 1968 by musician and music recorder Ramdew Chaitoe, who live in a small South American country named Suriname. 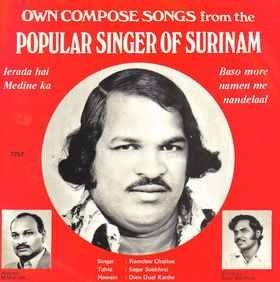 The album was entitled King of Suriname and all of the songs were religious in nature. There is also the Chutney Soca, and type of music according to Wikapedia, and originated in Trinidad and Tobago, Guyana and also Suriname. Chutney soca music is a crossover style of music incorporating Soca elements and Hindi-English lyrics, and Chutney music (as mentioned in the on set of this article) with Indian instruments such as the dholak and dhantal. But the Chutney we want to make extra special mention of is a food, and it is called Sweet Tomato Chutney. According to Food Reference, chutney original is from India (Hindi: chatni), and is prepared as a relish made from fresh fruits and spices. They go on to mention that Chutney is almost accompanied with every meal in India. 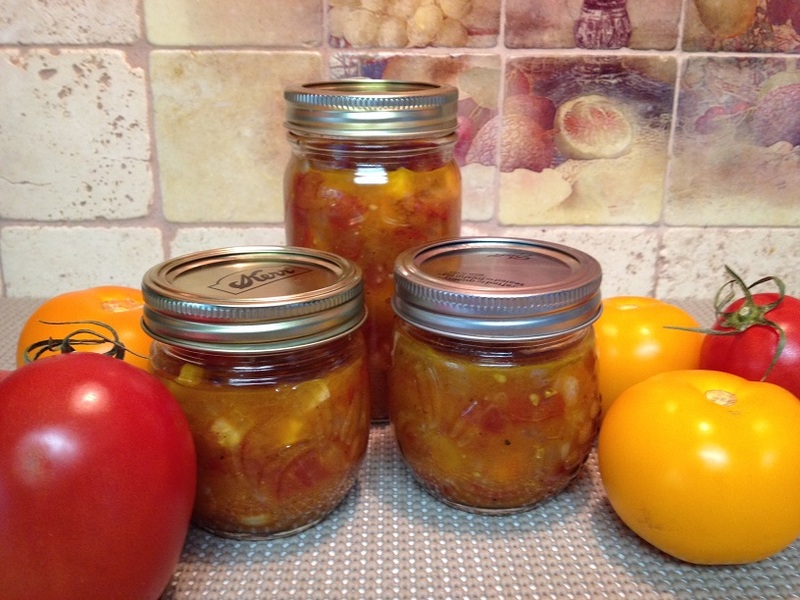 The relish can be fresh or cooked, and is prepared with varying flavors, ranging from sweet or sour, spicy or mild, or any combination of these. 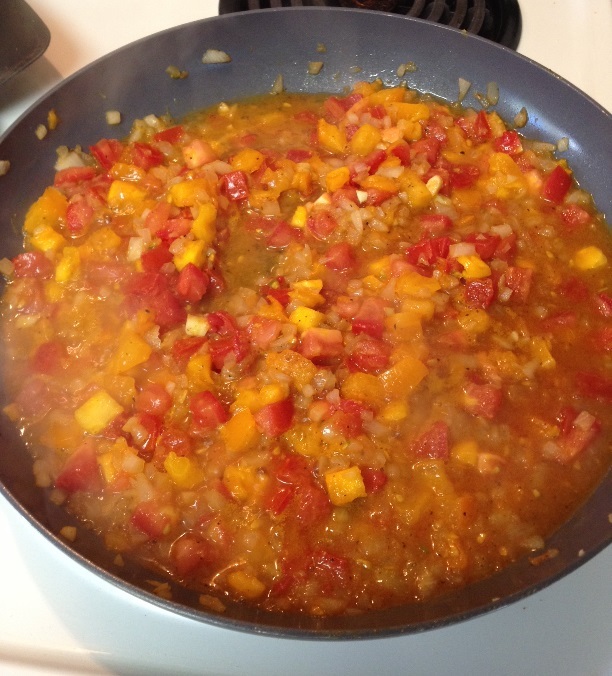 Chutney can be thin or chunky, and can be prepared with fruits or vegetables or a combination of both. The different types of ingredients used can be mango, apples, pears, tamarind, onions, lemon, tomato, raisins, coconut, vinegar, sugar, honey, citrus peel, garlic, ginger, mint, turmeric, cinnamon, cilantro, and hot chilies. There is a variety of ways to prepare chutney. It really just depends on what your palate prefers. Here is the version from the kitchen of Splendid Recipes and More…. The orange type of tomato we used was the Woodle Orange Heirloom Tomato, which we purchased at the Whole Foods Market. Over medium heat using a ceramic coated pan heat the oil. Next add onions, garlic, spice, and sauté for 2 minutes. Next add the diced tomatoes, salt and sugar. Mix to combine. Leave on heat another 2 to 4 minutes, while stirring tomato mixture. 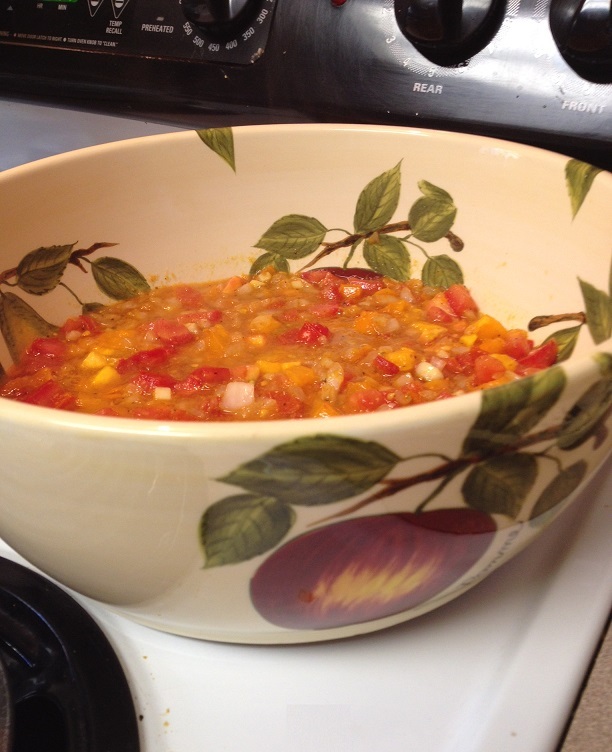 Remove from heat and pour mixture into a large mouthed mixing bowl, preferably ceramic,and allow chutney to cool. 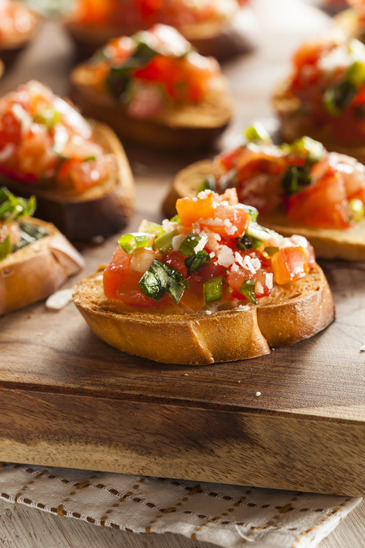 Chutney goes will topped over Bruschetta as shown here in the image. After the chutney has cooled, spoon into mason jars, top with lids, and tighten. Keep refrigerated. Every Sunday Mornin, Ya Hear Them Ol Ladies Singin!! This entry was posted in Dressings, Marinades, Salsas and Sauces and tagged Bruschetta, Chutney music, Chutney soca music, citrus peel, India, Mango, Mango Chutney, pie spice, Roma Tomatoes, spices, sugar cane fields, Tomato, Tomato Chutney, Whole Foods Market, Woodle Orange Heirloom Tomato. Bookmark the permalink. Yes Jackie, as shown in one image in the article you can put it on bread, and though it is a chutney you can use it as a salsa and eat it with corn chips. This morning I put some over sunny side up eggs. Thanks for your comment and stopping by Jackie! !